It was rainy today so about as close to a snowy day as we get here. Even though it was freezing last week it was dry outside - had we had this rain last week we would have had snow. Instead we get a week of cold then a week of rain. 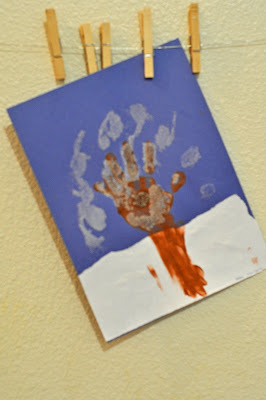 For our art project today we did a picture of a 'snowy' tree. This picture isn't so much in focus but it was one of the only ones that actually showed her face. That's something that has been seriously lacking in my picture taking lately as she is generally too busy too look at the camera or else she is making silly faces at the camera. After the paint dried we put glue on the picture and dusted it with some sugar to give it a snowy effect. Abby really enjoyed it - as always!